I started off by taking a short 4-week course and before I knew it, I was hooked! I can’t say I was surprised, it was a pleasure to spend one evening in the week with a group of friendly ladies, away from my iMac and doing something different. 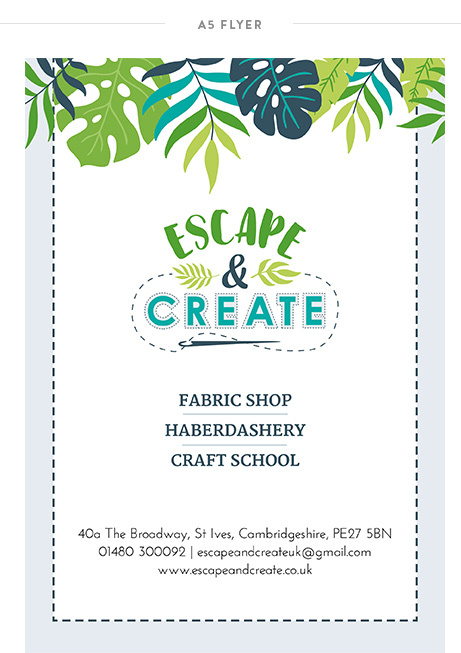 It was within this easy-going atmosphere and great learning environment that I met Julie, the lovely lady behind the already established business and brand, Escape & Create. When Julie contacted me with regards to wanting a brand refresh and new website I knew it was going to be a fun project. Her eye for detail and approach to working with others really appealed to me. Before getting too excited I wanted to sit down with Julie to ensure we were the right fit for each other, and to hear more about what her requirements are and why she wanted a brand and website overhaul. With so many changes in Julie's business to date, and yet many more exciting plans ahead a rebrand was definitely required to ensure Escape & Create not only looked modern but also met the new business vision, goals, and direction. The website was the second step in the process so in order to get the ball rolling we got started on the rebrand. Julie was well prepared for my pre-homework. I knew this because she had previously mentioned a few keywords in our early conversations, which I knew would work perfectly for her brand. Being such a forward thinker, Julie had also created a number of Pinterest boards for her future vision - one for the shop, one for the website, one for her logo design. Knowing all this filled me with joy as I knew it would be a straightforward task for Julie to complete the client homework. Using the keywords and detailed information that Julie supplied in the pre-homework workbook, and the Pinterest board created for the brand revamp, I pulled together images for the Escape and Create brand moodboard. I chose images that reflected a warm friendly environment. The colour palette is fresh, bright and light with a primarily green base and a pop of colour. This also aligns with the vision of the new shops look and feel, which will have lots of plants and be an open, airy and light space. Ideal for sewing eyes or purchasing haberdashery material. Once the moodboard is signed off, it’s time to start my favourite part - designing the logo concepts. My process for logo design is to create 2 or 3 different concepts, each incorporating the values of the brand, whilst also making sure it is eligible and simple in terms of look and feel. I usually start off with pen/pencil and paper. This is because as I am creating the moodboard I usually start generating some ideas in my mind which just need releasing and sketching out quickly. If I feel like the concept has some substance I then develop the digital version. Once I am happy with the digital version(s) I present them. I instantly knew what direction would work best for the Escape and Create brand and therefore I found presenting two genuine concepts rather than 2 genuine concepts and a third “maybe” concept would be the next step. I always present my logo concepts in black and white, so that colour does not influence the decision making. Like design, colour is subjective, therefore by taking out the colour, you are naturally made to look at the core components of a logo. Once a concept is chosen, I then develop it further, over 2 revision rounds. Then once it is signed off I also create a logo variation, a submark, a pattern or other brand elements - in this case, some lovely leaf elements. These are so that Julie has flexibility in the use of her new logo and brand. I recently amended my process to create the collateral items before completing the brand board. This is so that I can really experiment with ensuring the font choices I choose for Julie's rebrand go well together. I’m generally quite flexible with the collateral items. So when I mentioned to Julie that she may benefit from an A5 flyer as opposed to Twitter graphics, she totally agreed and so instead of 2 social media graphics and a business card PDF design, I designed her Facebook graphics, an A5 flyer which she will use to promote the shop, and also some business cards. The brand board is the final element in rebranding Escape and Create. I deliberately left it till last as I want to ensure every single element works well together. Being able to see all the visual elements, such as the colour palette, logo variation, submark, brand elements altogether will really help Julie to stay consistent as she moves forward in her business. I loved working with Julie, and I love how everything has come together really well. The colours, the fonts, the logos and the whole look and feel. It really is one of my favourite design projects of 2017.